Linor Goralek was born in 1975 in Dnepropetrovsk. She is a poet, prose writer, essayist, and translator. She is an author of 20 books of poems and prose as well as children’s books. She has translated to Russian Etgar Keret’s novels and Vitautas Pliura’s poems (in collaboration with Stanislav Lvovsky). Since 2014 Linor Goralik has been Editor-in-Chief of the Booknik.ru internet portal which is dedicated to the Jewish literature and culture. She teaches Costume Theory in the Russian State University for the Humanities and the Higher School of Economics in Moscow. 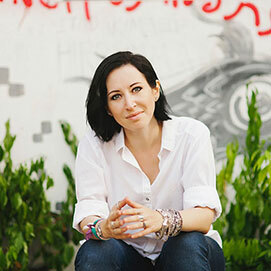 Linor Goralik won the Triumph Young Award (2003), Russian independent prize for excellence in literature and art, and the Portal Award (2012), international prize for phantasy novels and critics. Lives and works in Moscow (Russia) and Tel-Aviv (Israel).